A quantum internet promises completely secure communication. But using quantum bits or qubits to carry information requires a radically new piece of hardware—a quantum memory. This atomic-scale device needs to store quantum information and convert it into light to transmit across the network. 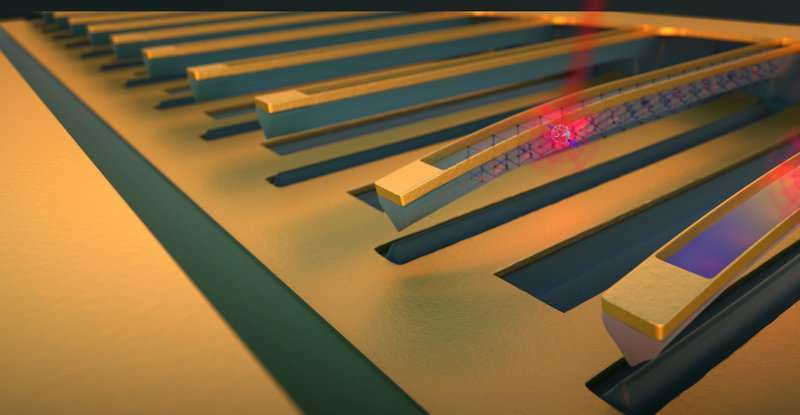 The researchers engineered diamond strings that can be tuned to quiet a qubit's environment and improve memory from tens to several hundred nanoseconds, enough time to do many operations on a quantum chip. "Impurities in diamond have emerged as promising nodes for quantum networks," said Marko Loncar, the Tiantsai Lin Professor of Electrical Engineering at SEAS and senior author of the research. "However, they are not perfect. Some kinds of impurities are really good at retaining information but have a hard time communicating, while others are really good communicators but suffer from memory loss. In this work, we took the latter kind and improved the memory by ten times." "Being an electron in a color center is like trying to study at a loud marketplace," said Srujan Meesala, a graduate student at SEAS and co-first author of the paper. "There is all this noise around you. If you want to remember anything, you need to either ask the crowds to stay quiet or find a way to focus over the noise. We did the latter." To improve memory in a noisy environment, the researchers carved the diamond crystal housing the color center into a thin string, about one micron wide—a hundred times thinner than a strand of hair—and attached electrodes to either side. By applying a voltage, the diamond string stretches and increases the frequency of vibrations the electron is sensitive to, just like tightening a guitar string increases the frequency or pitch of the string. "By creating tension in the string, we increase the energy scale of vibrations that the electron is sensitive to, meaning it can now only feel very high energy vibrations," said Meesala. "This process effectively turns the surrounding vibrations in the crystal to an irrelevant background hum, allowing the electron inside the vacancy to comfortably hold information for hundreds of nanoseconds, which can be a really long time on the quantum scale. A symphony of these tunable diamond strings could serve as the backbone of a future quantum internet."